Of the many lakes reached by short hikes along the Tioga Road in Yosemite National Park, Upper and Lower Cathedral Lake are generally thought to be the most beautiful, each surrounded by meadows and granite cliffs, without too many trees to block the views of nearby mountains. The path to the lakes is part of the John Muir Trail, the section between Yosemite Valley and Tuolumne Meadows, so receives a lot of traffic, both backpackers and day hikers. The lower lake is 3.3 miles from the highway and 1,000 feet above the trailhead, while the upper lake is 1.5 miles further (or rather less if walking cross-country); if anything the lower one is slightly more scenic and has a more dramatic setting though both are quite special. Cathedral Lakes topographic map, Tuolumne Meadows trails. 16 views of the Cathedral Lakes. The often busy trailhead is along the Tioga Road towards the west end of Tuolumne Meadows and nearly opposite another parking area on the north side of the road, overlooking the flat grassy plains that stretch for several miles. The path enters lodgepole pine woodland and reaches a 4-way junction; the John Muir Trail is straight on and left (to the meadows), and right is a path to Tenaya Lake. Walking onwards, the trees grow taller as the well-used route begins a steady climb through quite thick forest, gaining 480 feet up to a small plateau, where the path descends a little round a ridge beneath the jagged north face of Cathedral Peak, crosses a few streams and marshy areas then begins a second, steeper climb through more woods with restricted views. Some parts of the path are wide and sandy due to overuse, despite the trail receiving quite a lot of maintenance. 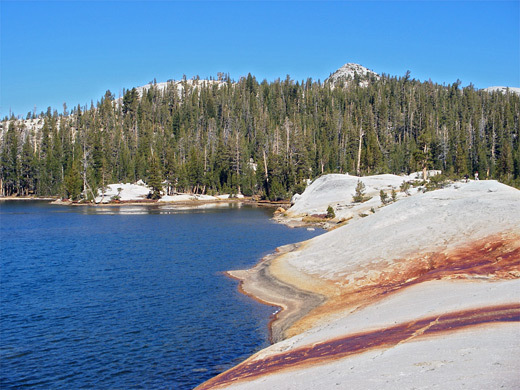 After the second climb, 2.7 miles from the start, a spur path branches off on the right towards Lower Cathedral Lake, but for the easiest loop hike it is best to continue on the John Muir Trail to the upper lake, which is reached in another 0.8 miles. 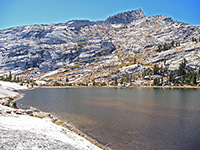 Along this stretch, trees fade away revealing gradually better views, especially around the lake itself, in the middle of a wide, grassy basin between four granite mountains, most distinctive being the twin summits of 10,940 foot Cathedral Peak to the north. Past the lake, the John Muir Trail rises gently up a slope to Cathedral Pass, the highest point on the route between Yosemite Valley and Tuolumne Meadows. On the far side is more flat grassland, flanked by low, woody hills; distant views southwards towards the valley are not for another mile or so. 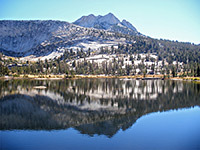 To reach Lower Cathedral Lake, an alternative to returning along the path is to walk around the west shore of the upper lake - passing good viewpoints of Cathedral Peak reflected in the calm waters - then hike northwest over a ridge and down into the curving, semi-circular granite bowl beyond. 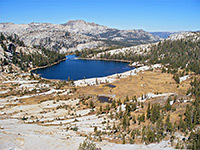 The lake occupies half of this basin and is bordered by marshy meadows containing several small brownish pools, with patches of smooth granite slickrock around the water's edge. The best perspective here is from the north side, looking across the lake to the steep cliff face beyond, forming the northern flank of Tresidder Peak.